When I first learned that Ryan did indeed have an allergy to dairy (after having suspected it for many months), I really started scouring labels. I knew for the most part what did and didn’t have dairy or milk, but it can very sneaky and often finds it’s way into a wide variety of processed foods. One of the items I quickly discovered that contained milk or cheese was jarred spaghetti sauce. There were/are a few that don’t have milk or dairy, but none that I liked! So I had to start making my own. Not a big deal at all. I quickly figured out that crushed tomatoes make the best spaghetti sauce with the right mix of garlic, onion, spices and pinch of sugar. The boys have been so patient with me over these last few months trying new meal after new meal as I tested recipes for the One Dish Dinners cookbook. I ditched the meal plan last week and decided to make them one of their favorites…spaghetti. But as I went to get the crushed tomatoes, there were none. No tomato sauce left either. Not even tomato paste. I did, however, have plenty of diced tomatoes. So I had to make do with what I had…and this was the result. 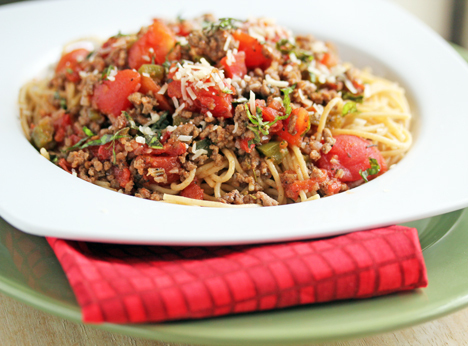 In a large skillet or saute pan, brown the ground beef with the minced onion and garlic. Drain and return to skillet. Ad the diced tomatoes, Italian seasoning, sweetener, salt and pepper. Bring to bubbling, then reduce heat to low and cook for 8-10 minutes. Garnish with fresh chopped herbs and Parmesan cheese. 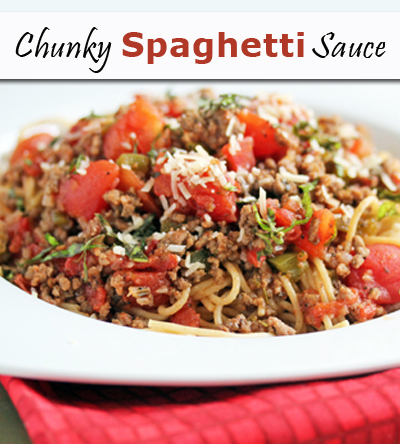 Serve my Chunky Spaghetti Sauce over noodles with side salad or spinach. Or corn. Or whatever. i always use diced tomatoes. I like to store the smallest number of ingredients. Diced works best for curries, etc. Anyway, you could try blitzing diced toms in a food processor. It’s a really good idea for picky eaters who might not want to see tomatoes in their sauce. The Splendid Table recommends chopping your ingredients together to meld the flavors better, so I add onion and garlic to my tomatoes before I start the food processor. We have milk, egg and fish allergies here so your posts are so appreciated!! Yeah for the new blog…Luigi (right?!) is adorable!!! I saw in your post tonight that Ryan has a dairy allergy. I wanted to let you know about Daiya cheese. It is completely dairy free/soy free/gluten free. I have a dairy allergy and this has opened up so many recipe options for me. It comes in three flavors and melts nicely. The only downside is that it isn’t super cheap, but it is worth every penny. I can find it at Kroger (in the Nature section) and at Whole Foods. Hope this helps. Thanks Allison. We do get the Daiya cheese on occasion! But for the most part, we avoid it! I always used diced tomatoes in my sauce. I like to use the petite diced the best and then add some dried basil, oregano, garlic, garlic powder and some parm cheese and pinch of sugar. I never measure out, just taste test as I go. Sometimes I will thicken it with some tomato paste if I have it on hand. It’s funny. So many people add sugar to their sause while I never do. Next time try without any sweetner. I make sauce similar this, I love it and my husband does too! When you start making your own sauce, it’s really hard to go back! It’s also fun to experiment with flavors. I love to put in diced carrots, a little bit of red pepper flakes (not much). I also add some sugar to calm down the acidity of the tomatoes. In the winter I used the canned, diced tomatoes. In the summer, I used garden fresh tomatoes! YUM!! I diced up one roughly and then put another one in the little food chopper to get a bit of a puree thing going on. It’s awesome! I thought I was the only one who added sugar to my sauce – I just made some this weekend with tomatoes from our garden and it was delicious! The reason why sugar is added to the tomato based recipes is to cut the acidity. The small amount of sugar does not really add to the flavor. It more or less just balances the acids. You could make it without the sugar but people who have sensitive stomachs may not appreciate the effects later on. Made this last night and it was “SO GOOD”. The hub and daughter were commenting on how good is smelled, I did however add a little ketchup and wocestershire sauce. I will never by spaghetti sauce again. I don’t know where you live, but a pound of ground beef (even if I buy bulk) is closer to $2.50 a lb. Uh… The recipe sounds tasty, but tell me where in America you can buy quality ground beef that actually has some BEEF in it for $1.49 a pound and I’ll stand on my head for you. Even ground round is double that. The recipes are from 2010 and prices have gone up considerably since then, especially on beef. the same time as other folks consider issues that they just do not know about. other folks think about issues that they just do not understand about. no coding knowledge so I wanted to get advice from someone wityh experience. Erin, here in TX a pound of ground beef runs about 3.88 and that’s the cheap stuff. Any suggestions?